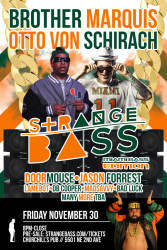 Strange Bass is back with 2 stages of weird! Brother Marquis (2 Live Crew) & Otto Von Schirach and the Bermuda Triangle Family will be on the inside stage providing heavy Miami beats. Along with Doormouse, Jason Forrest and much more. Outside will feature LAMEBOT, DB Cooper, MadSavvy and more of the Strange Media crew! Presented by Strange Media and the Bermuda Triangle Family.